Moderates walking for local culture experience, but many hikes are quite strenuous; some sites reachable by 4x4, and there are rewarding auto or foot tours to the plains. 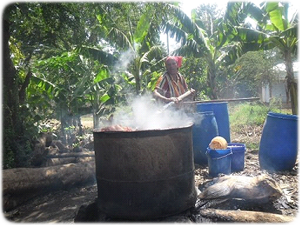 Food and Drink - Beverages and local food available in Usangi town; traditional meals can be arranged. What to be Bring - Hiking shoes, warm clothing. Accommodations - Guest houses ad rooms in privates homes, a school rest house; camping (bring your gear); day to trips from Moshi or Same. Getting There - 2 -3 hours by car from Moshi (4x4 during rains) via Mwanga on main Moshi / Dar es Salaam / Tanga road. You will be shown Maasai Boma, the oldest African irrigation system and experience waarusha cultural and enjoy traditional food. You will also walk into the house of the traditional healer who will answer historical questions. Craftsmen group will show you small wooden stools, jewellery, knives and traditional clothing. Its located 20km west of Arusha city along Nairobi road. Here you will have trekking experience of Ngorora Hill, thereafter visit Maasai Boma to have true experience of African Culture on general Maasai life, Maasai dancing group and visit Maasai colourful market. Near the Kenyan boarder, Namanga in Longido you will have a unique experience taming animals by camel ride, learn and even act the Maasai way of life. Animal and Bird watching experience is what you can never miss a day in Longido. In a cultural tour in Sapuk you will visit the amazing Waterfall, beautiful forest catchment, Hollytree view of the city of Arusha. The more you spend time in the tour the most you enjoy tour and learn more. Situated 63 km north of Mto wa Mbu, on the road to Oldonyo Lengai and Lake Natron is one of Tanzania’s most important historic sites. Some 500 years ago, a farming community of several thousand people developed an ingenious irrigation and cultivations system. For unknown reasons, the farmers left Engaruka around 1700. Many questions remain unanswered who were the people living in Engaruka, how did they come to develop such an ingenious, farming system and who did they finally leave Engaruka? Situated adjacent to Lake Manyara National Park. In Mto Wa Mbu is the only point in Africa where 4 languages meet; the Nilotes, Cush*tes, Bantu and Hamites a unique cultural feature in the World. A point in Tanzania where anthropology is most diverse. Visit to Maasai boma, dancing, market, schools and community project will be offered. Maasai village visit to foster the true experience of most complex cultural experience in Africa is a gift will be hard to forget in your entire life. Hike the rift valley wall and view the Lake Manyara. Visit Mto wa Mbu near Lake Manyara, for authentic cultural tours. Mto wa Mbu is situated on the way from Arusha to the great national parks of northern Tanzania , which include Ngorongoro and Serengeti. It is a green oasis just at the foot of the rift valley and bordering Lake Manyara . A visit to Mto wa Mbu includes farm tours, country walks and a view into the culture of many different tribes that have migrated to the area but have retained their tribal way of life. Walk from your lodge or campsite to the base of the Rift Wall. On the way you will walk across farms and meet peasants doing their daily farm activities. Then climb the wall and get the reward of watching the entire green oasis below you. The tour takes 1 to 3 hours. Walk or cycle in the surroundings of Lake Manyara to complete a wildlife tour of 2 to 3 hours. The tour brings you closer to Lake Manyara National Park and gives you the chance to see animals like zebra,wildebeest,, gazelle, and buffalo in the open plains. Lake Manyara National Park stretches for 50 km along the base of the 600 meter high escarpment of the African Rift Valley, and borders our village settlements. This is a special tour of 1 to 2 hours that offers the chance to see the irrigated farms of Mto wa Mbu and meet peasants and craftsmen. The tour includes a visit to a Makonde home where the family specializes in wood-carving, and also a visit to a Chagga family that makes banana beer. Farm tour also provides the opportunity to join a local family for traditional food. Spend 3 hours to walk from your lodge to Balaa Hill below the rift wall. The tour includes meeting the local people in their daily farm activities and visiting a local school. The climax of the tour is climbing the Rift Wall for the splendid views of Lake Manyara , villages, and irrigated farms. The tour also offers the opportunity to see species of birds and baobab trees. 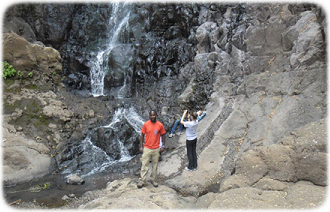 Miwaleni Waterfall and Lake tour. Forests and Moors Tours Half and fully day hikes, but tours of several days can be arranged. Highlights : clan forest and moorlands, historic centers of ceremony and magic; irrigation, dike, and drainage systems; traditional healers and potter; historical sites and relic; spectacular views of Mt. Kilimanjaro, plains, area likes, South Pares, Usambara, Mkomazi Game Reserve. Mountain climbing enthusiasts will be advised to visit the home and memorial of the late Yohano Lauwo, a Marangu and native who accompanied Dr. Hans Meyer on the peak of Mt. Kilimanjaro in 1889. You can also learn about the Chagga culture by visiting a traditional Chagga house with straw roof. You can visit the Chief Mangi area where the first court and primary school of the Northern region are still functioning. You will be able to pass historical sites of clan wars where the Chagga used large caves to hide themselves when the fought with Maasai. Its located 62 km South East of Moshi in the shadow of Mount Kilimanjaro. The Plains Pare Tours - Half and full days: visit the natives economic and cultural projects including carpentry workshop, brick factory, sisal plantation, local - beer brewery; Lembeni Herbal Hospital; forest hiking in Kindoroko Mts. Spice - garden tour; fishing and boating on Nyumba ya Mungu (House of God) Lake. Physical Requirements - Moderate walking. Food and Drink - Catering facilities in Kisangara. What to Bring - comfortable walking shoes; sun cream and hat Accommodations - Self-contained cottages, campsites (bring your gear) day trips from Moshi and Same. Getting There - by bus or car, 62km from Moshi on main Arusha - Moshi - Dar - Tanga road. View point Headquarters Tours - Half o 3 days; caves where Pares hid from slave raiders; myriad viewpoints in all directions (Mt. Kilimanjaro, Usambara, Maasai Steppe, Mkomazi Game Reserve, Taita Hills) forests and moors, historic German-era buildings; traditional healers and crafts people farmers and women's groups. Most sports accessible by car or 4x4. Visit Mkomazi, a botanic as well as zoological wonder. Physical Requirements - Brisk walking, steep hills. Food and Drink - Meals in villages or at Hill-Top Tona Lodge, Mbaga Hills, can be arranged; snacks beverages, water in stores. What to bring - Comfortable walking shoes, warm clothing. Accommodations - Hill-Top Tona Lodge, quaint pre-WWI German buildings; local home stays are available, especially on overnight hikes; camping (bring your gear.) Getting There - By car (4x4 in rains), entering mountains from Dar \Moshi road or via Kisiwani on east side, north of Mkomazi; by bus from Same. Situated on the coast, South of DAR ES SALAAM, half an hour drive from Kigamboni ferry side. You will experience the village life and enjoy the quiet Beaches, bird watching and the village handcrafts. Situated about 50km South of Tanga, that is in the extreme North-Eastern corner of Tanzania at the Indian Ocean Coast. You will have a Pangani town tour including historical buildings, visit a former slave labour camp and slave market site, cruise the vast coconut plantations and fish with local fishermen.